According to the Ukrainian national survey carried out by the publishing house The Yurydychna praktyka ( The Legal Practice) in cooperation with Forbes-Ukraine and the news agency Interfax-Ukraine Ilyashev and Partners Law Firm ranks the 7th in the list of Top 50 Law Firms of Ukraine 2014. Over a number of years Ilyashev and Partners law Firm has been an undisputed leader in litigation sphere based on the great number of court and arbitration disputes. In 2014, 19 out of 50 major disputes were led and supervised by the lawyers of Ilyashev and Partners during the period from the IV-th quarter of 2013 till the III-rd quarter of 2014. It needs to be noted that only the resolved and closed disputes were taken into account. In addition, Ilyashev and Partners Law Firm holds No. 1 position in “Market leaders. Bankruptcy” sphere, with a great number of cases included into Top 50 Major Transactions and Top 20 Major Taxation Disputes. The Ukrainian national survey Top 50 Law Firms of Ukraine 2014 is the only Ukrainian professional rating offering a diversified “evaluation” of law firms and giving an unbiased view on the legal services market. Study participants are ranked according to several criteria: a number of lawyers employed, profitability, financial performance, complexity of transactions and court disputes led and supervised by a law firm, reputation in the professional environment etc. An important criterion of the survey is identification of major transactions and arbitration cases supervised by law firms during the period under research. 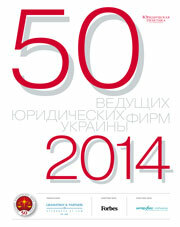 Special edition of Top 50 law firms of Ukraine 2014 is distributed as an attachment to The Yurydychna Praktyka (The Legal Practice) newspaper (No. 47 as of November 25, 2014), editorial edition of The Forbes-Ukraine (No. 12 December 2014) and among subscribers of The Interfax-Ukraine news agency.